FILE - A map illustrating China's 21st-century maritime Silk Road, or the so-called "One Belt, One Road" megaproject, is displayed at the Asian Financial Forum in Hong Kong, Jan. 18, 2016. The World Health Organization has warned China that its coveted Silk Road program can result in the spread of disease, because movements of people and goods can transfer viruses, too. "We have learned from many years of experience that with movement of people, goods and services, diseases also move around," Margaret Chan, WHO director-general, told journalists in Beijing after a recent meeting with Chinese President Xi Jinping. "For the first time, China has imported cases of yellow fever, Zika and Rift Valley fever," Chan said. She called on China to enhance its level of public health preparedness to counter any outbreaks. The Silk Road program, formally called One Belt, One Road (OBOR), is an economic program aimed at helping Chinese construction companies win infrastructure contracts and assisting Chinese industries in transferring their operations to less developed countries in Asia where costs are lower. Beijing would be most unlikely to reduce OBOR in light of WHO's advice, although the central government might act to check the spread of disease. FILE - Smokers are seen on a street in Shanghai, China, March 22, 2012. It turns out that the Chinese government is playing two conflicting roles. It has taken some significant measures to ensure public health. At the same time, the government is engaged in activities that can result in increased health risks. The OBOR project is just one of them. One example is the government's involvement in the sale of cigarettes to the 300 million Chinese who are smokers. Most of the major Chinese cigarette companies, which account for 41 percent of the entire world's production, are state-owned. Moreover, cigarettes are a major source of tax revenue — $30 billion a year. "The Chinese state has a monopoly on cigarette sales. The government also depends heavily on tax income from tobacco. So it is difficult for authorities to drastically crack down on smoking," said Simon Lang, researcher at Mercator Institute of China Studies in Berlin. At the other end of the scale, the government is investing heavily in hospitals for treatment of cancer and a range of other diseases that are either caused or exacerbated by tobacco use. It has no other choice but to address the issue, because cancer and cardiovascular diseases, which also are aggravated by smoking, are responsible for two-thirds of total mortality in China. By some estimates, the number of people over 40 suffering from noncommunicable diseases will more than double in the next two years. Diabetes will be the most prevalent disease, while lung cancer cases are likely to increase fivefold, according to experts at advisory group China Policy. FILE - In this July 24, 2008, file photo, obese patients wash their plates after lunch at the Aimin Fat Reduction Hospital in Tianjin, China. A study released at that time said China had surpassed some richer countries long plagued with diabetes to develop the world's biggest epidemic. Conflicts of interest do not end there. The World Bank recently said that lifestyle and noninfectious diseases like diabetes and lung cancer have emerged as the biggest causes of death in China. Infectious illnesses play a smaller role. WHO is asking the government to lessen the role of hospitals in health care and expand the role of preventive care and family physicians. "I told President Xi that my Chinese dream is to have a good general practitioner looking after my health when I retire," said Chan, who is a resident of Hong Kong and is due to retire from WHO in a year. She was emphasizing the importance of general practitioners in preventing the spread of disease and creating better health awareness while reducing the dependence on hospitals. The government has laid out an extensive program for building health infrastructure, mostly hospitals and related facilities, because Beijing sees such investment as a tool for shoring up the softening economy. It is unlikely to adhere to WHO's advice to shift its focus toward preventive medicine. "This is really a problem of governance and institutional structures. It is hard for the system to establish reasonable incentive structures for GPs [general medical practitioners]. Specialists are what the system prefers to produce, and this ripples through to the way hospitals are structured," said David Kelly, research director of Beijing-based China Policy. 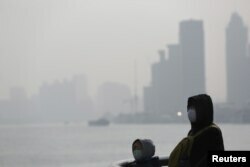 FILE - People wear protective masks near the Bund during a polluted day in Shanghai, China, Jan. 19, 2016.
WHO studies have shown that air pollution is a major cause of death around the world. Chan praised China's efforts to combat pollution by shifting industries away from heavily populated cities to areas of low pollution. But as anyone living in Beijing will attest, the Chinese capital suffers heavily because it is downwind from highly polluting factories, even though many of them are far away from the city. This is another challenge the government must meet, at a precarious time. Falling economic numbers are making it difficult for authorities to close down polluting factories and mines, because that would result in lower production and higher unemployment. The government fears laid-off workers can cause a lot more trouble than air pollution, observers said, which is why some of WHO's objectives conflict with those of the government in China.